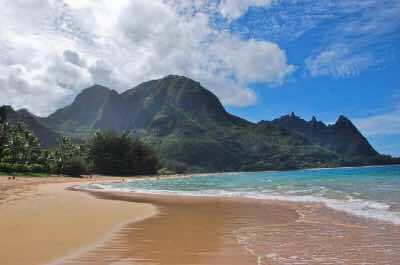 Kauai beaches offer travelers of all shapes and sizes some of the best options in the Hawaiian Islands. You will be thrilled with the numerous options you have with the best swimming available at Anini Beach as well as at Hanalei Bay. You can go to a remote location like Polihale State Park with white sands stretch for over 7-miles and is ideal for ATV and 4WD enthusiast. Tunnels Beach boasts the best snorkeling for novices as well as advanced snorkelers and scuba divers. If you are looking for something different then try Hapuna Beach which has gorgeous black sands and Pali Ke Kua Beach offers seclusion. Most beaches offer a variety of watersport activities like windsurfing, kite surfing and surfing in the winter months. Whether you are searching for a family beach, a snorkeling beach or just someplace to watch a gorgeous sunset, you find this beach on Kauai. 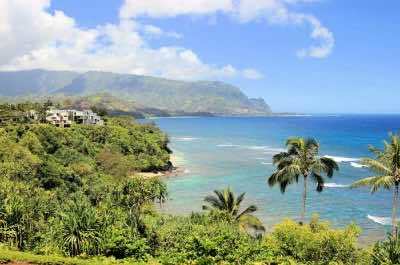 Hanalei Bay is the perfect Kauai beach for families, couples and travelers looking for a picturesque setting with many options for watersports. Located on the north shore just south of Princeville, Hanalei Bay is nearly 3-miles long and is the largest bay on Kauai with almost 2-miles of gorgeous white as well as golden sand beach. 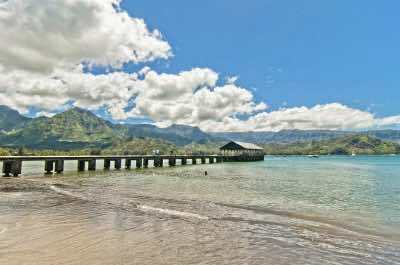 Hanalei Bay contains four beach parks which are Waikoko, Black Pot, Hanalei Pavilion and Wai'oli. Each park has facilities and Black Pot Beach Park has a public boat ramp as well as a historic 300-foot pier. Watersports are a big attraction here with surfers carving the big waves on during the winter months and throughout the summer there is great swimming, snorkeling, kayaking, sailing as well as standup paddle boarding. The pier attracts many different people throughout the year for fishing, family entertainment and live music. The historic town of Hanalei is situated in the middle of the bay and offers a great day of exploring art galleries, architecture and the culture of Hawaii. There are plenty of options for food and drink that overlook the bay such as the Happy Talk Lounge, Makana Terrace and the Hideaway Pizza Pub. Poi'Pu Beach Park is a spectacular Kauai beach for families, snorkelers and scuba divers that are interested in exploring the underwater world that surrounds Kauai. 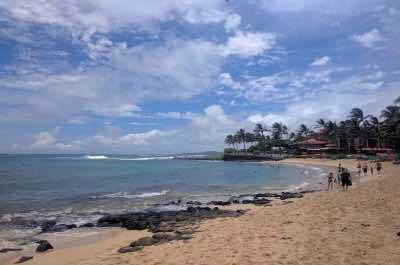 Locate on the most southern tip of the island, Poi'pu Beach Park has a great stretch of white and golden sand beach and even though this beach is one of the busiest on Kauai, there is sufficient space to never feel crowded like you would on Waikiki Beach. Poi'pu Beach Park is composed of two beaches that are separated by Nukumoi Point and each section offers something for everyone. Baby Beach is ideal for families with children that want to swim in the Pacific Ocean and the western side of Nukumoi Point attracts snorkelers, windsurfers and various types of fishing from shore. Poi'pu Beach Park has received many awards over the years including best beach in America by the Travel Channel. There are facilities at Poi'pu Beach Park and several dining options when you are hungry that include Brennecke's Beach Broiler, Red Salt as well as Anuenue Cafe which serves healthy Hawaiian cuisine. Makua Beach also known as Tunnels Beach is a Kauai beach that was made famous by the movie South Pacific and offers some of the island's best snorkeling as well as scuba diving. Located on the north shore of the island near Makua Beach overlooks the Maniniholo Bay and offers a great stretch of white and golden sand beach with ample ironwood trees for shade. Makua Beach is perfect for families with two reefs that have differing levels of calm water. The inner reef is ideal for novice snorkelers who want to view the incredible marine life that lives within the coral reefs of Hawaii. The outer reef is the ideal spot for more advanced snorkelers and scuba divers who are seeking to view such features as lava tubes and tunnels, coral formations, arches as well as caverns. The outer reef in the winter months also attracts many surfers as well as windsurfers who are challenged by the bigger breaking waves. There is no facilities located Makua Beach but Hanena Beach Park is within walking distance. If you forgot to pack a picnic lunch there are usually several local food trucks that serve island delights daily. Anini Beach offers some of the best swimming families can find at any of the Kauai beaches. Located on the north shore of the island only 15-minutes from Princeville, Anini Beach is sheltered by a 2-mile long fringed reef that helps provide for calm waters and a great family atmosphere. Anini Beach boasts the best swimming on the island and there is plenty of space to lounge so the beach never seems overly crowded. Other popular watersports here are kite surfing, fishing and windsurfing. There are plenty of vendors that rent equipment for all types of watersport adventure including kayaking and standup paddleboarding. Snorkeling is excellent here when the water conditions are clear and not murky. In the evening many people visit Anini Beach to enjoy a picnic supper while gazing at the sunset and the stars are bright after dark. There are also camping facilities at Anini Beach and several kite as well as windsurfing schools nearby. If you get hungry for local cuisine then try The Bistro or the Nanea Restaurant and Bar. Polihale State Park is one of the most challenging and a beautiful Kauai beach that is highlighted by one of the longest stretches of beach fronts which is perfect for remote camping as well as a variety of watersports. Located on the eastern shoreline of the island along the Na Pali Coastline, Polihale State Park has a stretch of white sand that is over 7-miles long and 300-feet width with several sand dunes that reach heights of 100-feet. 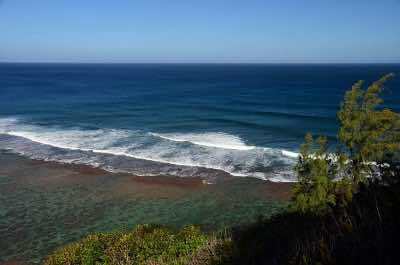 Polihale State Park is remote and requires driving on a very rough road for 5-miles until you reach shoreline. Polihale State Park area is revered by locals as “The home of the underworld” where the souls of the dead enter Po or the underworld. The beach offers limited swimming in a few locations such as Queen's Pond and is popular with ATV as well as 4WD enthusiasts. One drawback to this remote beach area is that some of the area such as Barking Sands Beach has been restricted to military personnel only since the 9/11 attacks. There are facilities here and camping is available with a permit. Bring what you need to eat and drink because there is nothing nearby. 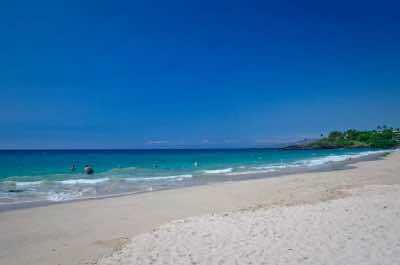 If you are seeking a truly different experience when you visit a Kauai beach, then you should try Hapuna Beach. Located on the western shoreline of the island, Hapuna Beach is also known as Waimea Beach and sports beautiful rare black sand that boasts superb views of the Forbidden Isle as well as for watching sunsets over Niihau. Waimea Beach has a great stretch of black sand for lounging and the surrounding landscape is highlighted by old Bayan trees, coconut palms and large grassy areas. The landscaped area associated with Waimea Beach will bring back memories of the large plantations that once dotted the islands. Activities at Hapuna Beach consist mainly of enjoying evening sunsets and star gazing as well as shoreline fishing or fishing from the Waimea Pier. If you get hungry while you are strolling on the black sands then stop at Porky's Kauai for barbeque and the Ishihara Market serves Asian as well as Hawaiian specialties. Tunnels Beach is a great Kauai beach for many watersport activities and is ideal for active travelers as well as some families. Located on the north shore of the island, Tunnels Beach is composed of two reefs that provide for calm waters near the shoreline. At Tunnels Beach the crescent shaped beach boasts plenty of golden sand stretches and Ironwood trees for shade when you are lounging. Tunnels Beach is protected by two reefs offshore that include an outer reef just 1/8-mile that is ideal for advanced scuba divers and provides excellent opportunities to view lava tubes and tunnels, coral reefs as well as arches. The inner reef provides perfect conditions for novice snorkelers to enjoy the underwater world that surrounds Kauai. During the winter months surfers and windsurfers take advantage of the breaking waves on the outer reef. There are no facilities at Tunnels Beach but you are within walking distance to the services at Haena State Park. When you get hungry while visiting Tunnels Beach then give Pink's Creamery or Sushi Girl Kauai a try. Pali Ke Kua Beach also known as Kenomene is a secluded Kauai beach which is ideal for people looking for solitude and don't mind a 10-minute climb down a steep slope. Located on the northern shoreline of the island, Pali Ke Kua Beach is separated from Hideways Beach by a large rock outcropping. Access to this 300-feet crescent of golden sand is somewhat challenging and requires following a trail that has ropes as well as an old handrail to help with the climb down and up. Pali Ke Kua Beach has a nice stretch of sand for lounging and the snorkeling is ideal and you will probably spot sea turtles in the water. Lounging is good with plenty of trees onsite for shade. Pali Ke Kua Beach is not recommended for families and is an ideal beach for couples looking for adventure. If you like to kayak you can start at Hanalei Bay and reach the beach by paddling. There are no facilities located at this beach. When you are hungry you can grab something at Lapperts Ice Cream or a cold libation and a Hawaiian-style lunch at Tiki Iniki. 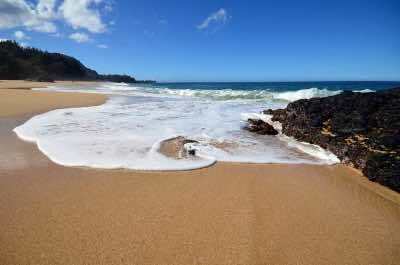 One of the most pleasant Kauai beach for relaxing, walking and family outings is Shipwreck Beach. Located on the southeastern shoreline of the island, Shipwreck Beach is situated between Point at Poi'pu and Makawehi Point overlooking the blue waters of Keoniloa Bay. Shipwreck Beach also known as Keoniloa Beach has a sharp break at shore and is ideal for body boarding but other watersport enthusiasts like windsurfers, surfer and boogie boarders also take advantage of the is beach. The beach is a favorite with families that are picnicking and lounging under the sun with an occasional walk along the nice white sand. When you visit Shipwreck Beach you will find easy access to Makahewi Point which is a lithified sand dune by way of a nice hiking trail. There are no facilities located on the beach and the nearest place to grab a bite to eat would be Tidepools for Polynesian and Dondero's serves Italian.